Google, common “frenemy” of academic librarians everywhere, has put together a short online class called Power Searching. The course is designed to teach you how to find good, quality information more quickly and easily while searching Google. When I first heard about this course, my first thought was “Ah, Google is stealing my job!” After I calmed down a bit, I read over the description for the course and decided to enroll. I wanted to check out our potential competition and I hoped I might be inspired by new ideas and tools to incorporate into my teaching. The course is divided into six classes and each class is further broken down into short videos. Each class totals approximately 50 minutes of video content. Following each short video there is an optional opportunity to test the skills demonstrated by David Russel, Senior Research Assistant, through an activity or quiz. The course contains a pre, mid, and post class assessment. After successfully passing both the mid and post class assessments, you receive an official certificate or completion. To supplement the concepts taught in the classes, Google search experts also offer forums and Google Hangouts. When I took the course, it lasted about two weeks and a new class was released every three days or so. The classes could be completed any time prior to the specific due date. The classes themselves definitely hit on topics that we usually cover in our library workshops, such as choosing good keywords and thinking critically about the source of the information. But for the most most part, it was about more about clicking this and then clicking that…similar to a typical electronic resource demonstration. I did get bored a few times and skipped some of the activities. Also, I never had the motivation or desire to participate in any of the forums or Hangouts, but that was mainly due to my busy schedule. Despite all of this, I’m not too proud to admit that I also learned a few things–specifically on how to specific operators and how to do an image search. So, is Google stealing our jobs? No. (At least not right now.) What academic librarians do that Google cannot is work with researchers on the gray, messy stuff like choosing a research topic, determining what types of info are needed, and figuring out the best way to use information. If more first-year and non-traditional students took the initiative to enroll in Google’s Power Searching class, I think it would help me as a librarian to focus more on those gray areas and less on the logistics of doing a simple search. While from a pedagogical stand point I didn’t have any “Aha!” moments, I may incorporate some of their search examples into my future library sessions. Have any other librarians taken Google’s Power Searching class? I’d love to hear what you think of the course and its content. ACRLog welcomes a guest post from Pete Coco, the Humanities Liaison at Wheaton College in Norton, MA, and Managing Editor at Each Moment a Mountain. Early this July, Google unveiled its Knowledge Graph, a semantic reference tool nestled into the top right corner of its search results pages. Google’s video announcing the product makes no risk of understating Knowledge Graph’s potential, but there is a very real innovation behind this tool and it is twofold. 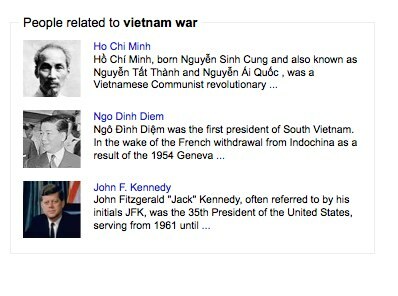 For one, Knowledge Graph can distinguish between homonyms and connect related topics. For a clear illustration of this function, consider the distinction one might make between bear and bears. Though the search results page for either query include content related to both grizzlies and quarterbacks, Knowledge Graph knows the difference. For years, Google’s search algorithm has been making countless, under-examined choices on behalf of its users about the types of results they should be served. But at its essence, Knowledge Graph presents a big symbolic shift away from (mostly) matching it to web content — content that, per extrinsic indicators, the search algorithm serves up and ranks for relevance — toward the act of openly interpreting the meaning of a search query and making decisions based in that interpretation. Google’s past deviations from the relevance model, when made public, have generally been motivated by legal requirements (such as those surrounding hate speech in Europe or dissent in China) and, more recently, the dictates of profit. Each of these moves has met with controversy. Librarians and others teaching about internet media have a duty to articulate and problematize these developments. Being in many ways a traditional reference tool, Knowledge Graph presents a unique pedagogic opportunity. Just as it is critical to understand the decisions Google makes on our behalf when we use it to search the web, we must be critically aware of the claim to a newly authoritative, editorial role Google is quietly staking with Knowledge Graph — whether it means to be claiming that role or not. The value of the Knowledge Graph is in its ability to authoritatively parse semantics in a way that provides the user with “knowledge.” Users will use it assuming its ability to do this reliably, or they will not use it at all. What is Knowledge Graph’s editorial standard for reliability? What constitutes “knowledge” by this tool’s standard? “Authority”? 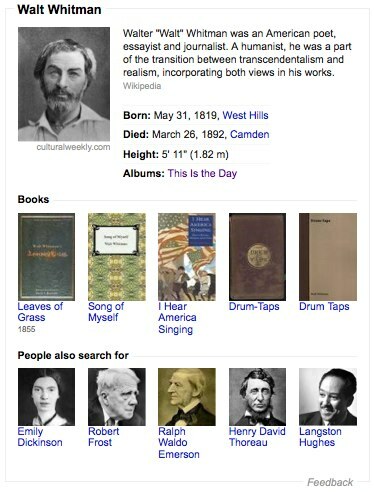 Parsing this mistake might bring one to a second search: “This is the Day Walt Whitman.” The results list generated by that search yield another Youtube video at the top, resolving the confusion: a second, comparably flamboyant Walt Whitman, a choir director from Chicago, has recorded a song by that title. Note the perfect storm of semantic confusion. The string “Walt Whitman” can refer to either a canonical poet or a contemporary gospel choir director while, at the same time, “This is the Day” can refer either to a song by The The or that second, lesser-known Walt Whitman. Further, “This is the Day” is in both cases a song, not an album. Many Google searches sampled for this piece do not yield a Knowledge Graph result. Consider an instructive example: “Obama birth certificate.” Surely, there would be no intellectually serious challenge to a Knowledge Graph stub reflecting the evidence-based consensus on this matter. Then again, there might be a very loud one. Similarly not available in Knowledge Graph are stubs on “evolution,” or “homosexuality.” In each case, it should be noted that Google’s top ranked search results are reliably “reality-based.” Each is happy to defer to Wikipedia. In other instances, the stub for topics that seem to reach some threshold of complexity and/or controversy defers to “related” stubs in favor of making nuanced editorial decisions. Consider the entries for “climate change” and the “Vietnam war,” here presented in their entirety. 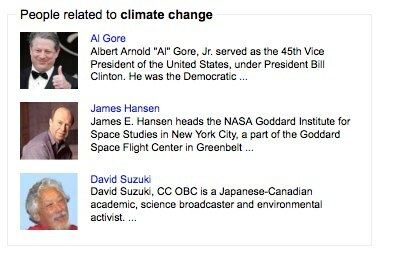 In moments such as these, is it unreasonable to assume that Knowledge Graph is shying away from controversy and nuance? More charitably, we might say that this tool is simply unequipped to deal with controversy and nuance. But given the controversial, nuanced nature of “knowledge,” is this second framing really so charitable? 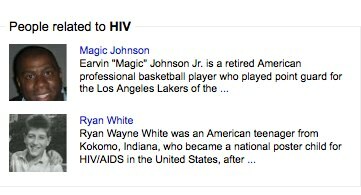 There are countless reasons to be uncomfortable with a definition of HIV implicitly bounded by Ryan White on one end and Magic Johnson on the other. So many important aspects of the virus are omitted here — the science of it, for one, but even if Knowledge Graph is primarily focused on biography, there are still important female, queer or non-American experiences of HIV that merit inclusion in any presentation of this topic. 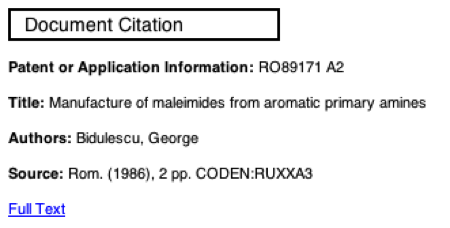 This is the sort of stub in Knowledge Graph that probably deserves to be controversial. What portion of useful knowledge cannot — and never will — bend to a machine-readable standard or methodology? Of course, Google’s problem here is that it searches everything for every purpose. People use it everyday to arbitrate contested facts. Many users assume that Google is programmatically neutral on questions of content itself, intervening only to organize results for their relevance to our questions; Google, then, has no responsibility for the content itself. This assumption is itself complicated and, in many ways, was problematic even before the debut of Knowledge Graph. All the same, it is a “brand” that Knowledge Graph will no doubt leverage in a new direction. Many users will intuitively trust this tool and the boundaries of “knowledge” enforced by its limitations and the prerogatives of Google and its corporate actors. I’ve been hearing less and less about Google+ lately, the social network launched by the search giant over the summer. I can’t comment on its functionality because I haven’t tried it; while I’m interested, I’ve got a couple of big projects going on and don’t have the bandwidth right now for an additional flavor of social media. However, my partner is on Google+ and recently let me know that he added me to a circle. I have a Google account and use lots of other Google services, but feels weird that people I know can add me to Google+ circles even though I’m not using the service. It’s worth thinking about the way social media and internet services are monetizing (or trying to monetize) our personal content. Like many librarians and academics I rely on these services frequently, though I’ve lately begun to question whether the advantages and convenience that they provide are worth it. Last month the professional social networking website LinkedIn retreated from an earlier decision to include photographs from their users’ profile pages in ads for the service. This was just the latest in what seems to be an ever-increasing number of news items about social media companies that push their users’ comfort levels with privacy a bit to far. A few months ago I quit Facebook because I was concerned that their privacy policies are growing evermore fluid at the same time that everyone seems to be using it to post information about events, photos, etc. Every time I commented on a friend’s wall or uploaded a picture of my kid I felt like I wasn’t getting nearly as much out of my end of the relationship as Facebook was from me. I have to admit, though, that I do miss the easy access to information from a wide range of folks I know from many stages of my life. Like Facebook, Google uses our personal content to sell ads. Of course, selling internet ads is Google’s whole business: we are Google’s product, and the longer Google can keep us online, the more money they can make selling ads. I don’t use Gmail because I have another email provider. But I’m a heavy user of other Google services. I keep my personal schedule in Google Calendar because at our library we use it for our internal scheduling. 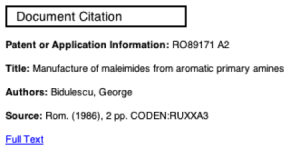 I use Docs to collaborate with colleagues everywhere: in my library (though we are shifting to an internal wiki for much of that), with colleagues across the university system where I work, and with long-distance collaborators. And checking in with Google Reader is a staple of my daily routine. But lately I’m reconsidering all of the personal content I’ve willingly given to internet services. I’m not sure how to ramp down my use of these tools that I’ve become so dependent on, especially given the number of people I work and communicate with who use the same tools. What’s the appropriate balance of control over our personal content and convenient, useful services? And how should we help guide students in making these same decisions?